Mongolia has over 3 million horses. Most herders that own horses own around 1000 horses per family. Horses are not handled until they are broken in at varying ages of one and two years of age. Once the horse is good enough to ride, the Mongolian horse is turned out until they are 4 years of age. The Mongolians go by the horse’s teeth for the horse’s age. How do Mongolians break in a horse? The Mongolians lasso the wild Mongolian horse and will do whatever it takes to hold onto the horse. It’s not unusual to see a few Mongolian herdsmen holding onto the lasso being dragged across the terrain. The herdsmen will twitch both ears if required as well. A rope gets put around the horse’s girth area while as many herdsmen as it takes hold onto the wild horse. One herdsman hops on the horse, no helmet, no bridle, no headstall, no saddle etc. The horse is then let loose in the open steppes of the Gobi Desert, which bolts bucking. Once the horse stops bucking, another herdsman comes galloping along beside and catches the freshly ridden Mongolian horse with a long stick with a rope hanging on the end of it and slides it over the free horse’s neck to catch the freshly ridden horse, then the rider hops off. I know some people will not agree with this type of breaking in horses. Yes, the horse is scared, but never physically mistreated. They do not hit or kick these horses. Mongolians absolutely love and cherish their animals. Have you ever been frightened in your life with your own personal fears? I know I certainly have, and I am one to face my fears and push through as best I can. (Yes sometimes I fail, but I always learn something along the way when I do fail, so in my opinion it’s still a lesson well learnt). I can say honestly I believe I come out stronger and better once I face my fears and overcome them, and I totally relate this to the way these Mongolian horses are broken in. It’s the Mongolian culture. These horses need to be tough to survive the harsh Mongolian winters and the hot Mongolian summers. These are tough strong-minded horses. I felt so honoured to be allowed to watch how the Mongolians break in their Mongolian Hhorses. After being informed the herders don’t normally name their animals and we could choose names for fun, I decided to name my horse each day after a famous Australian name. Only for Training Day 1, Training Day 2 and Day 1 of The Gobi Desert Cup race we are using the exact same horse. Training Day 1 was getting late when we arrived. Kaz from New Zealand and I were the last people to have our horses saddled, and were told to be quick before it was dark. Unfortunately for me my horse did not want to move. I used the sound "Choo Choo Choo” and my horse still did not move. I did actually reach back and tap my horse on the rump with my hand to get him to move forward. My horse came across as casual and with a laid back attitude, so I named him Mick Dundee. It was quite funny, because poor Kaz was stuck with me and my horse that wouldn’t move. Kaz’s horse would take off as soon as I said “Choo Choo”! Kaz would pull her horse up to wait for me, as soon as I got near her constantly telling my horse, “Choo, Choo", her horse would take off again. After several repeats Kaz said to me “Don’t say that word!” I couldn’t stop laughing. As Mick Dundee does, he went walkabout that night and could not be found the very next day. Because the horses wander unfenced each night, he apparently started back for home. I was given a new horse, which was actually quite pleasant to ride, as he moved when I asked, and my horse went along at a nice quiet pace. He had a quiet temperament. I had no idea what to name this chestnut gelding, so my friend Ruth named him Hugh Jackman. Hugh also went walkabout that night. Possibly off looking for his friend, Mick. I was given a horse that I thought was a stunning looking gelding. He had so much attitude on the ground and began rearing when the herder was trying to put the bridle. Being impossible, he was hobbled to be bridled and saddled. I expected this horse to buck once ridden, we had the option to ask the herder to ride our horse first. So I defiantly took them up on the offer. He went around nicely for herder, so I felt confident getting on. I went to mount, but this horse would get quite nervous as you approached. The herder had to really hold and settle this horse, so I named him Russell Crowe, as he has played up a bit in his time. Russell was fantastic to ride, I really him even with all of my toilet stops. Russell soon settled down with people approaching him and became comfortable with me getting on and off. Towards the end of the 80 kilometer ride I was defiantly relaxed and felt great on this horse. Russell was easy to ride and I relaxed. I twisted my upper body sideways talking to Kaz and Steph from New Zealand when Russell threw in a really little buck to keep me on my toes. Note to self, stay focused on these amazing hardy horses. I could not take my feet out of my stirrups to stretch my legs, Russell spooked at the stirrup moving around. I came in =7th and rode in at 3.23pm. I was delighted and surprised at the night presentations to win Best Managed Horse with Russell. I won a Blue bonnet that you put on your horse! I heard the USA team say the Grey Horse bucked off the herder, and I looked over to see the horse had my saddle on!!!!! I asked the herdsman to put the Blue Bonnet on my horse and they replied, “No not on this horse, he is to spooky”. I approached to mount and it was more jumpy than Russell Crowe. Once again the herder held and settled the horse while I got on. This horse was a little ripper to ride and with my experience being a positive one yesterday I went out feeling confident. Ruth’s horse was getting saddled and it looked very similar to my horse, so we decided to name our mounts B1 & B2. So Ruth and I waited. This took about an hour by the time the vehicle drove back, resaddled another horse and a herder rode it to where we were waiting with Jon’s first horse which he had named Saturday. Jon made the mistake of also calling his second horse Saturday, and about another 5km forward Saturday went lame with a stone bruise. It was a very rocky track. We knew the checkpoint was another 4 to 5 km, so Jon dismounted and led Saturday while Ruth and I rode off ahead to inform the checkpoint that Jon had retired and needed to be picked up. At the checkpoint, of course I needed to get off to go to the toilet on B1 who was flighty. So I did my Gobi Desert squat (there are not toilets and normally no where to hide and squat on the course, so being the wee queen, I would just squat anywhere). I went to get back on B1 and he jumped around so much, I fell onto my back keeping hold of my reins. B1 started running backwards (after watching the herders being dragged yesterday) it didn’t hurt so I kept hold of my reins until B1 stopped. A herder then held and settled B1 for me to get on. Ruth and I were the last riders apart from Jon, so we all discussed with the checkpoint people and agreed the vehicle would head back to help Jon and Saturday. It was an extremely rocky track but Ruth and I both felt we had good horses to ride, so we really concentrated on watching the ground. We thought the grass on the left of the track looked a tad better, so we road our horses on the left of the track. We rode for a while and came to an intersection. However, we could not see our pink tape markers anywhere. We rode a few meters right and left looking for pink tape but could not see it, so Ruth said, “No tape right or left means keep going straight.” I wasn’t so convinced BUT on our rides together at home in Australia, I was always wrong and Ruth was always right with directions, so I said fine, lets keep riding straight. It was actually a beautiful scenic ride. We saw a trough and decided to ride our horses slightly off track to offer them some water. It was extremely muddy and boggy to get to the trough, but we rode through it to get to the water but unfortunately our horses wouldn’t drink. We continued riding on the track and came to a Y intersection. (Ruth had her Map my Walk with her, but unfortunately forgot to turn it on when we started to ride, so Ruth didn’t know how far in km we had ridden.) Once again at the Y intersection there was no pink tape, Ruth and I discussed our ride. There had been no other tracks, so it must be correct to keep going straight. Maybe the pink tape blew away from this Y intersection, we looked for horses hoof prints, but there was horse prints both side of the track. Ruth dismounts and writes several times R&T-->. Ruth went to mount B2 and overshot it, nearly going off his sensitive right side. B2 freaks and takes off bucking. I thought Ruth was going to stay on but she hit the deck quiet hard. I was actually worried as I saw Ruth hit the ground quiet hard and lying still. I think I said first, “I think you are winded, try and breathe” then I defiantly said, “I can’t get off my horse”. Poor Ruth lying winded and still, was laughing at what I just said, a massive sigh of relief for me, even though it was a struggle for Ruth to laugh. My original concern was, if she unconscious, do I get off knowing I couldn’t get back on B1 by myself, as well as my horse B2 being unsettled on the ground with people. BUT what if she isn’t unconscious just injured but needs help, I need my horse to ride and find help, as I knew we were near no one for miles. Luckily for me Ruth was fine and got up. But stupid us we continued riding up the track! Ruth did have a headache, I was slightly worried but didn’t want to tell her. I did see how hard she hit the ground. Ruth checked her Map my Walk and said we had ridden 22km since she turned it on, so it was then we both knew we were the wrong way, as today’s first ½ of the ride was a 40km loop back to camp. I can’t tell you how disheartened and disappointed we both felt, as we both felt our 480km ride would be incomplete. We agreed to ride back the exact way we came, straight back to camp. It felt like such a long ride back. We rode back through our Y intersection and a bit after that we heard a whistle coming from where we stopped by the trough. There now was a Mongolian herding his stock to the water and he whistled to Ruth and I and waved his arms and pointed to the water. He could not speak English but we knew he was telling us to give our horses a drink. My horse B1 put his mouth in but did not have a lot of water at all, I think Ruth said her horse B2 was pretty much the same as B1, we would have been happier if both horses had a decent drink. We rode on and at the cross intersection we stopped and looked again for the pink tape but still couldn’t see it. It wasn’t too much past the cross intersection that we saw the race marker we were supposed to follow, the pink tape was now on our left crossing through the grass. Ruth and I had assumed we would always turn on the tracks and didn’t see the marker because we were riding on the other side of the track. It was 11am. We had been riding since 7am and the cut off time was 12pm. We assessed that our horses hadn’t had enough water, hadn’t eaten, and we would have to fly around to be finished by 12pm. (Honestly I felt as if my horse had eaten and drank he had the potential to do this). 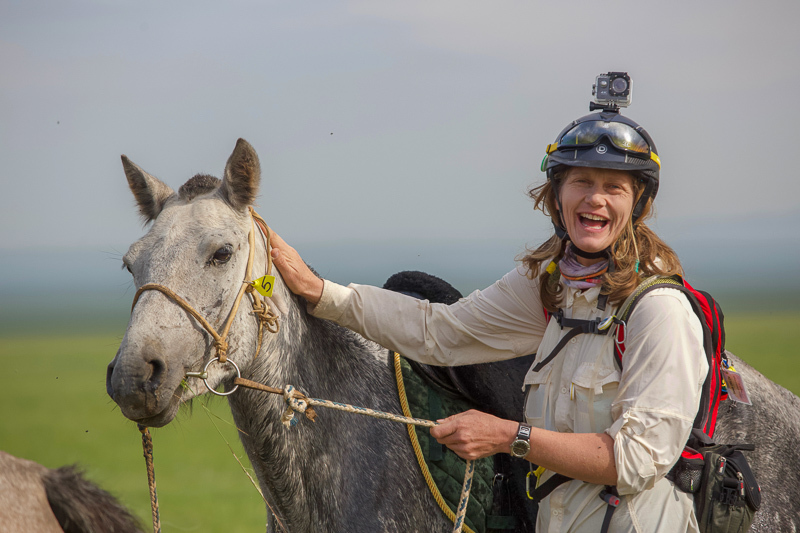 It would have been cruel to make our horses complete the rest of the 40km loop in their situation, because we knew our horses hadn’t drank or eaten so Ruth and I both held our heads down low with such disappointment and continued to back track home. It was then when one of our support vehicles saw us. They stopped to give our horses and us food and water and told us a support vehicle will wait up ahead and keep an eye on us as we traveled back to camp. Ruth and I put on our brave faces and pretended it was alright and we were happy not finishing the course. We then continued to ride back to camp. Then, from out of nowhere a Mongolian man came galloping down the mountain on his horse toward us. He could not speak English but rode with us for a while. He then looked at Ruth and I, calmly swung his rope (Mongolians use this like a whip, but instead of hitting the horse they swing it beside the horse) and he calmly said, “Choo Choo". I looked at Ruth and said, “I think he wants to race us? Are you up for a race?” Ruth said, “YES!” So off we went, it was so much FUN! We only galloped for a short amount of time and then we all came back to the walk, the Mongolian man grinning from ear to ear. The Mongolian man started showing off and Ruth and I were loving watching him. He would sit, behind his saddle, touch his horse’s flank as the horse would react with a kick out or a buck, he got of his horse, tightened his girth remounted his horse and would pick grass from the ground from his horses back. The Mongolian man dismounted from his horse and pointed to my camera, so we all took photos of each other together. Once again while riding he looked at me swung his rope and said, “Choo Choo”, so we all raced a short distance again. He kept waving to us both and pointing to a ger, so Ruth and I would say goodbye and wave back to him but he didn’t leave. We didn’t understand. Eventually he did leave, BUT then he came back. (In hindsight now, I think he was inviting us to his ger). The man would point to my head camera, and giving me gestures but I had no idea what he was saying. He kept pointing to my head camera, so I took it off and gave it to him, he had a fiddle and gave it back to me. I was getting concerned and said to Ruth, I don’t think he wants to be videoed. He definitely wanted his photo taken. I was so confused, I thought to myself he did that preying signal, what if that’s a sacred mountain or place that he doesn’t want videoed? I was so paranoid; I stopped videoing just in case. The Mongolian man then pointed to my head camera again so I gave it to him and he kept hold of it. I was so paranoid and worried that I had videoed some sacred spot or something. Ruth, The Mongolian man and I continued riding towards our camp, pretty much playing charades with each other because of the language barrier, it was so much fun. The disappointment of getting lost completely disappeared now, because of this amazing time we spent with this mystery local man. Our guide pointed to ride up a short but steep hill of the track. I looked and could see The Gobi Desert Cup 4WD and flag on top of this hill, so the three of us rode up the hill. At the top of the hill the man handed our driver my camera and spoke to him. Unfortunately our driver could not speak English, so we could not ask him what was said. As soon as we got back to camp, our driver handed me back my camera. It was the next day when I seen the driver of the 4WD and Ena our gorgeous Mongolian girl who was traveling with us as an interpreter for us. Ena asked the driver what was said. Apparently, the Mystery Mongolian Horseman was asking to watch the video. Thumbs up meant was it good, fist with little finger meant is the video bad. He was praying to see the video with his hands in Preying position and eye gesture he made. We were shattered as Ruth and I would of invited him back to camp, as Ruth had her Polaroid camera and could have taken a photo of him to keep. It was such an amazing adventures day, just as B1 & B2 do. HOWEVER at breakfast this morning, we were informed not to hurry as most of our horses had gone walk about and the herders were still out finding some of them. Horses are tied to a horse line during work hours. However once the horses are not needed they are tied two together, generally one horse is hobbled and then tied to another horse around the neck. The horses learn to eat, drink and move around together. So I’m guessing this night the horses just wandered off together quite far. On this day I was given a lovely black horse, I instantly thought of names: Black Beauty, Black Caviar? I couldn’t quiet decide, and thought I will get a feel for this horse and name it later. This black horse was stocky and quiet to ride. I thought it might be a slower ride, however this horse proved me wrong. He enjoyed hanging at the back of the group but keeping up, I really felt like I was on a trail riding horse, this horse happily plodded along mainly behind USA team member Allan’s horse. There were about 10 of us riding towards the finish line together. Not everyone wanted to hold hands and go through the finish line as one group. I did say out loud, “Aww, I hadn’t had a chance to come through 1st yet, and that was my chance as a group.” Near the finish line I’m not sure if Alan was joking or for real, but he said “Go for it Tania”, so I gave a holler and told my horse to gallop. To my surprise my horse did go (as I mentioned earlier, I really didn’t ride this horse earlier, because it just followed, it didn’t want to be a leader). So that is the story of my first place and I named my horse, Black Caviar. This is where I learnt more about my horses heart rate. I galloped toward the finish and my horse’s heart rate was up. I did a little bit of Endurance riding leading up to The Gobi Desert Cup but I wasn’t experienced. I was under the impression we wet our horse, scrape the excess water of and rub there coat backwards to keep them cool. However, I have never done a gallop finish and with my horses heart rate higher. It was nice of Christoph from the USA team who came over, took my horses heart rate and helped me with advice on strapping that I hadn’t had explained to me before. My horse was fine, as his heart rate was dropping with strapping, I just needed to cool him and continue the strapping procedure until his heart rate reached 64 beats per minute. *Apparently if the heart rate isn’t dropping with strapping under 10 Minutes, you probably won’t get your horses heart rate down in time. *Don’t let your horse eat for at least 5 minutes before vetting in, as this increases the heart rate. *Encourage your horse to graze/eat the last two hours of your ride to help gut sounds in your horse. I came 1st and rode in at 2.47pm. There was a Foot and Mouth outbreak in Mongolia and the land affected was in quarantine, so our course had to be changed last minute for safety. Instead of moving camps we rode two 40km loops instead. Our camp was in a beautiful location and I loved it, so not moving was fine by me. Sunrise and sunset looked just amazing at this camp spot, as we were on top of a hill. I thought my horse was Spunky. He reminded me of Russell in the looks department from day 1. But since he had a mohawk, he had to be named Warwick Capper! Warwick wore the Blue bonnet that I won for Best Managed Horse.We all rode as a group today and it was fun. There was Elo (from France), Myself, Mathilde (French, but lives in N.Z) and Allan (USA) at the very front of the group near the finish. Mathilde and Allan were eyeing of each other and next thing I know they took off in a race, then so did Elo. in all honesty it was great to watch, I didn’t feel my horse had it in him to gallop, so we stayed back. In the distance I saw a red back pack pull back from the race ahead. Allan later said he pulled back his horse, as he didn’t realise how far the finish line actually was and he knew it would possibly be too much for his horse. Elo came in second but finished first because of the vet out. Allan placed 3rd but his horse also had a high heart rate. I came in 4th but received second place because of the vet outs. The whole group of us got spoken to and were told we rode our horses too hard and too fast, as I think it was around 2.30pm today when we completed 80km on difficult terrain. I came 2nd and rode in at 2.30pm. Pre ride we were all reminded about our horse’s welfare, and also that this was the hottest day we are expecting so far. Ned had a kind nature but was a plodder. I find these horses hard to ride as they won’t go forward on their own and it’s such an effort to try and keep them going. Our first 40km stop I unsaddled Ned and went to take his heart rate. Ned cow kicked but because his kicks were not fast or vicious, so I wasn’t worried. I didn’t worry about the stethoscope, I tried rubbing the area with just my hand hoping I could get him used to being touched in that spot, but he just kept cow kicking. Camille came over and told me not to worry just get the vet to check my horses heart rate for me. After lunch a handful riders went to get our horses from the herdsmen. The herdsmen hold several horses at once, and a few riders realised our horses looked very alike. As I mentioned previously we normally point to our horse and the herdsman would pass your horse to you. I tried to explain with my hands that I needed to touch my horse to see if he was mine. I walked up to the horse I thought was mine and touched it’s girth area. Sure enough, he cow kicked, so I smiled at the Herdsman and gave him the thumbs up, he smiled back at me and handed me Ned Kelly. Ned was a plodder, I honestly felt if I pushed him we might vet out, so we embraced the plodding and took our time. It was a fun ride still, and a local family drove up to us and had their photos taken with the riders. I was surprised how hot it was when we stood still for the photos, it was good riding with Claire and Mike, who are experience endurance riders, as it was a really hot day and they explained it’s much better to trot than walk, because the trot created a breeze, in the walk we could really feel the heat. Even through general riding and conversations and talking, Mike and Claire would explain simple but important information (I’m unsure if Mike and Claire realised they were doing this). For example, it’s good to let the horses have a canter and stretch out, as the horse will still stiffen to just trotting. I really needed a pen and paper to remember all the tips and hints. Today did feel like a long and hot ride. I came =6th and rode in at 2.59pm. Today I named my horse Chris Hemsworth, he was a well built chestnut gelding. In all honesty being the last day, I really wanted to finish riding in the front group. Chris wasn’t a leader, but actually wanted to keep up at the back of the front group. I was more than happy with that. We got to about 30km checkpoint and Julie checked Chris’s heart rate and told me it was around 100BPM and that was too high. Because Chris wanted to keep up behind the front group I decided it would be better to get off and lead Chris for a bit until the front group was out of sight. Once the frontrunners were out of sight I got back on Chris and rode with the next group of people. Chris by then lost his mojo and really didn’t want to go, so the rest of the day was actually hard work to keep Chris moving forward. I briefly spoke to Ian one of our vets (Ann, Nara, Julie, and Ian were our awesome vets and all are amazing people). Ian said perhaps Chris had a buddy or another horse from his heard in the front group, hence the reason he wanted to keep up. Pete, Jon, Amy and I rode together slowly, My opinion had changed from really wanting to end today in the front group, to I would rather come in slow, than take a gamble of vetting out, if I push my horse knowing it’s heart rate was high early, my chances being I would more than likely fail vet check and be eliminated. Today I came = 6th with Amy, Jon, Pete and myself and rode in at 2.59pm. Overall I finished in 4th place. 4th place finisher Tania Orlov with Ride Director, Camille Champagne. We had teams of four riders as well as individual placings. My team was called “The Leftovers” because that’s exactly what were. Claire and Mike didn’t want to be on a team and my team were the last four people not on a team, hence our team name. The Leftovers came 2nd. YAY! My team was Cele, Ruth, Howard and myself. From left to right: Cecilia Stone, Tania Orlov, Ruth Benney, and Howard Kent. Overall this was so much fun, everyone was fantastic and even though the Mongolian Herdsmen didn’t speak English, they were all lovely, helpful and polite. If you were stuck with a horse a herdsman was always seen and would approach you to help. You can honestly see how much the Mongolian people love their horses. We had a Mongolian Doctor, Nara the Mongolian Vet, Michelle and Ena Mongolian interpreters, Mongolian cooks and crew to set up and pack up. Every single one of these people are beautiful and amazing. Our group of riders and organisers were also all amazing, it was such an awesome fun trip to The Gobi Desert. I would love to return to The Gobi Desert, but actually hire or buy some horses to travel in The Gobi Desert and stay with some locals to experience their way of living and surviving in their homes the gers. And I would absolutely love to meet and stay with Eagle Hunters and the Reindeer Herders. It may never happen, but is on my bucket list. Watch Ruth and Tania tell their story in their own words!